The Sikh religion is amongst the youngest of faiths, having been founded just above five hundred years ago. Since the gurus all received divine inspiration for their writings, it is one of the revealed religions. While the faith includes some features existing both in Hinduism and Islam, it is not a fusion or synthesis of the two. Essentially, it is a separate faith and has evolved into a separate religion. Again, though there are similarities with the Bhakti movement, the Sikh faith is not an integral part of the former. There are several differences between the two; Bhakti advocates renunciation, a Sikh's spiritual quest remains within Grahasti. The focus of worship for Sikhs is the One Supreme, Formless, Eternal Lord and not any icons or human beings. Sikhs do not recognise any caste and believe in universal brotherhood. They are dedicated to seva of all, as opposed to the seeking of emancipation or moksha of the individual. The Sikhs pray for sarbat da bhala. The translations of Gurbani wherever occurring in the text are my personal effort. I do not claim any literary merit but, to the extent possible, I have attempted to convey the essential meaning and spirit of the original. 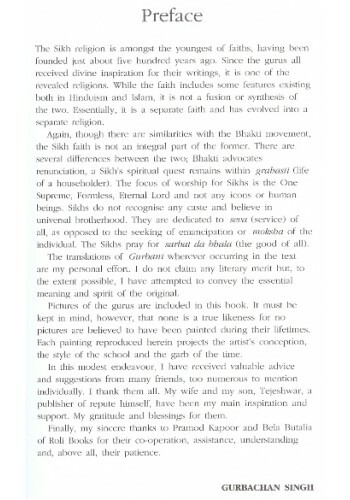 Pictures of the gurus are included in this book. It must be kept in mind, however, that none is a true likeness for no pictures are believed to have been painted during their lifetimes. Each painting reproduced herein projects the artist's conception, the style of the school and the garb of the time. In this modest endeavour, I have received valuable advice and suggestions from many friends, too numerous to mention individually. I thank them all. My wife and my son, Tejeshwar, a publisher of repute himself, have been my main inspiration and support. My gratitude and blessings for them. Finally, my sincere thanks to Pramod Kapoor and Bela Butalia of Roli Books for their co-operation, assistance, understanding and, above all their patience. In this lucidly written account of one of the world's youngest faiths, the author gives an introduction to the history, customs and practices of the Sikh people. 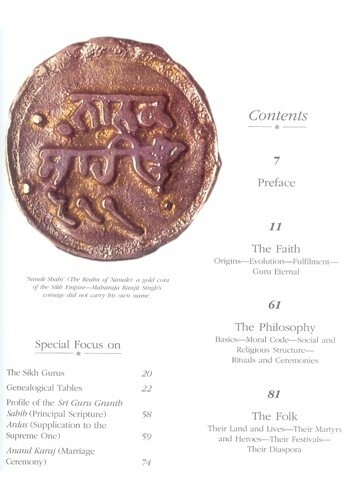 It narrates the origin of this unique faith at the hands of a man with a vision and extraordinary intelligence and traces its evolution over a span of more than two centuries under the guidance of the Ten Gurus, religious heads who showed the way to the Sikh people. 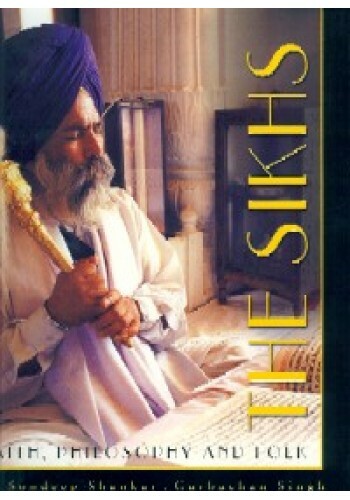 The book briefly leads its readers on a journey through the experiences and teachings of the gurus, the philosophy and the festivals of the Sikhs, who like other faiths, delicately nurture their very own beliefs and mores. It is punctuated by passages from the Sikh scriptures and describes some important ceremonies and rituals. 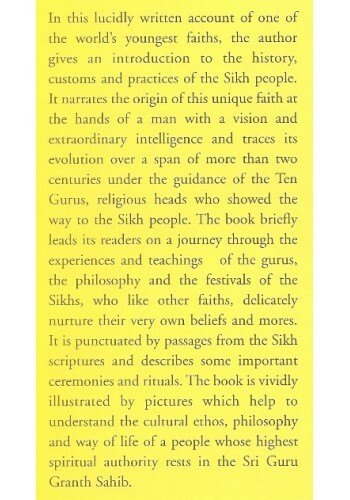 The book is vividly illustrated by pictures which help to understand the cultural ethos, philosophy and way of life of a people whose highest spiritual authority rests in the Sri Guru Granth Sahib. Gurbachan Singh (born in 1923) has had a long and distinguished career in the Indian Foreign Service from which he retired in 1981. After postings in Washington, London, Paris and Thailand, he served as India's envoy in Morocco, Kenya, Sri Lanka Switzerland and the Vatican. Despite over thirty-six years of living and travelling in foreign countries, in addition to five years of schooling in London, his roots remain firmly in the soil of India. He belongs to one of the most notable families of prepartition Punjab and, since childhood, carries an abiding interest in the Sikh faith and philosophy.